Explore the most comprehensive adaptation of J.R.R. 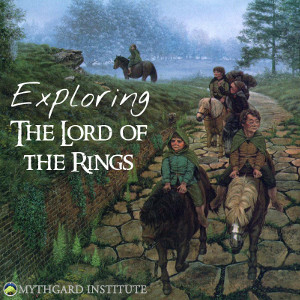 Tolkien’s The Lord of the Rings with the Mythgard Institute. This massively multiplayer online game developed by Standing Stone Games is an attempt to bring Tolkien’s Middle-earth alive in a virtual world while remaining as consistent as possible with Tolkien’s original work. In the game, players participate in quests that follow the story of the trilogy and cross paths with members of the Fellowship as the story progresses. Along the way, LOTRO players take part in important scenes of the story. For example, as part of the Epic Quest line, players can witness the breaking of the Fellowship or enjoin epic battles, such as the Battle of Helm’s Deep. One of the coolest aspects of the game, however, is not merely the adherence to the plot of the original story, but the extrapolation and adaptation that the Standing Stone Games team has brought to the world. Players can participate in important events that happen tangentially to the trek of the Fellowship through Middle-earth. For example, one quest has players searching for the missing Rider after the flooding of the Fords of Bruinen, while a series of other quests allow players to muster the Grey Company and join them in their ride south. Recorded sessions are also available on the Signum University YouTube Channel. Accompany Dr. Corey Olsen – the Tolkien Professor himself – for free weekly seminars that explore J.R.R. Tolkien’s seminal fantasy novel. The conceptual heir to Dr. Olsen’s book Exploring J.R.R. Tolkien’s The Hobbit, this program examines themes from The Lord of the Rings chapter by chapter using LOTRO’s interactive virtual world of Middle-earth. A “field trip” to one or more sites in LOTRO that relate to the subject matter. During the field trip each week, Dr. Olsen also discusses how Standing Stone Games has adapted Tolkien’s work. Not a gamer? No problem! While Dr. Olsen will be using LOTRO as the discussion space, “Exploring The Lord of the Rings” is designed to be accessible to anyone who wants to participate. Attendees will be able to listen and interact with Dr. Olsen through the Signum University Twitch channel. Like Mythgard Academy, session recordings will be available on YouTube shortly after each session.